Taking the hassle out of transporting heavy wheelchairs, this rack comes with a hydraulic system, eliminating the need for a ramp as the rack can be lowered to the floor and making it easy to manoeuvre your mobility scooter onto the rack. Designed to carry mobility scooters, electric wheelchairs, four wheeled buggies and lift 200 kilos the platform is fitted in less than 20 seconds with no tools required and folds vertically when not in use. 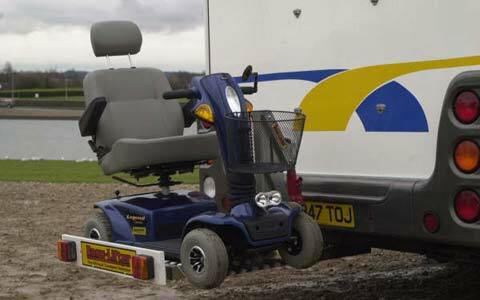 Delivered complete with light board & towbar adaptor there is no more straightforward cost effective solution to active independence. With so many interesting and varied places to explore the simple ease and convenience of the Easy-Lifter Mobility Rack can really help to make your leisure time a pleasure again. No more heavy lifting or struggling to accommodate your mobility scooter or wheelchair in your vehicle. Simply secure, raise and away you go. Easy to operate; the hydraulic system makes it effortless.